Looking for the perfect location for your destination wedding? Look no further than the Entertainment Capital of the World, Las Vegas! An ideal location for your destination wedding, where all of your guests will have an amazing time. From the groom and his men to your Grandma and everyone in between; Las Vegas has something for everyone. Scroll down to see how Las Vegas can be better than you’ve ever imagined. So you’ve decided to have a destination wedding in Vegas? Now, you’re going to need a place that accommodates your wedding party and your family. Possibly a few kiddos? Maybe your Grandparents? Don’t worry Vegas has you covered. We’ve personally stayed at Vdara and it was spectacular. This particular hotel does not have a casino, but it is a short 5 minute walk to the ARIA Resort & Casino. Great option if you don’t want to deal with all the hustle and bustle of a casino. Bonus! Most of the suites come with a gourmet kitchen and a washer and dryer. The Shops at Crystals are just a hop, skip and jump away with all the luxury brands you love and features an impressive selection of restaurants. Be sure to create an itinerary of the week's events. * Wedding Tip* Get in touch with your guests or post on your wedding website the wedding itinerary. Make it clear when your guests will have free time for Las Vegas activities and suggest they book them in advance before the trip. Discover the wonders of this historical structure and how it came to be. Acrobats, musicians, comedians, and more. There are so many shows to see it will be hard to decide. There are more than 50 golf courses in the Las Vegas area. We guarantee that your favorite golfer will find one of the celebrity-designed courses to their liking. How much would your groom like to get behind the wheel of a Lamborghini, Ferrari or Porsche Race Car? At SPEEDVEGAS he can do this. The ice lounge, Minus5 at Mandalay Bay, is always a cool (minus 5 degrees Celsius or 23 degrees Fahrenheit), filled with sculptures made from 100% pure Canadian ice. Everything around you is pure crystal clear glacial ice, from the seats to the cocktail glasses. For private functions, they are able to make you a custom ice sculpture. 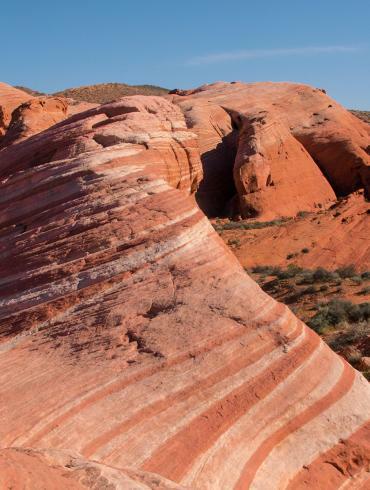 Go off-roading and explore the Mojave Desert. Perhaps take a Death Valley Tour, where you will experience many of the sights that make Death Valley so incredibly unique. Like - Dante’s Vie, which is located 5,000 feet above Death Valley. Star Wars fans will recognize the view as it was a filming location when Luke Skywalker and Obi Wan Kenobi overlook the Tatooine spaceport of Mos Eisley. After all the fun you and all of your guests have had, it’s time for the big day. There are so many fabulous places to choose from, it will be hard to pick. Looking to have a wedding with a view, then The Platinum Hotel and Spa is a great choice. Located off the strip with a 17th rooftop terrace with panoramic views of the Las Vegas Strip. An elegant and sophisticated setting for your Las Vegas Wedding. The Havana Room at the Tropicana Las Vegas can accommodate both the ceremony and the reception! With its state-of-the-art technology which allows you to change the lighting in the room to coordinate with your wedding colors. You are sure to have an all-night dance party here. Regardless of what you select, your experience will be top notch and exactly what you envisioned. Most of all the luxury hotels in Las Vegas can create a custom wedding experience at any budget. From arranging to have those pink peonies in your wedding bouquet, to creating a custom dinner menu for you and all of your guests, it will all be custom designed around you and your wedding style. Think Las Vegas for your up and coming destination wedding.